Then as I laid out the items I was packing in orderly heaps, I noticed an especially large mound. The load I mentally labeled “Health & Beauty,” ever since my time as a saleswoman at JC Penney’s decades before, surpassed all my clothing. What had happened? I knew I neither was using more makeup nor carrying additional beauty equipment. At least 9 pairs of glasses: reading, reading back-up, reading sun; same three for medium distance and far. Maybe some bifocals. As I surveyed the piles, I realized I’d reached an age-stage. Just as babies need lots of extras, so do aging folks. One method to approximate someone’s age is to survey his luggage. If his health and beauty pile is larger than his clothing, he must be approaching 55 or 60. Ditto women even if their hair and lips appear like youngsters’. So what does this mean? Another example of age discrimination. 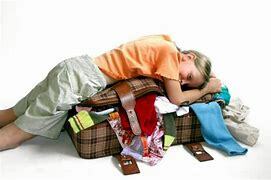 Why can’t luggage limits be based on age and the amount of necessities? If the privilege of affordable housing can be given to those above a particular number of years, certainly airlines, trains and buses can waive the restrictions on baggage for us. As for the practicalities of body strength, if we get tired of toting the extra weight, we can reduce the number of items we lug. To disguise the need for extra makeup we can wear concealing scarves, droopy hats, or extra-long bangs. To hide physical disabilities, opt for obscuring baggy clothing. Squint instead of packing extra glasses. Or just suffer discomfort without our extras. This entry was posted in To Think About and tagged age, aides, beauty, clothing, Health, packing, travel, trips by Bonnie McCune. Bookmark the permalink. Excellent and very funny, Bonnie. Getting older ain’t for sissies. Thanks for your perspective. Guess you’re a brave one, too.